Falling in love with Love Warrior. Yesterday I finished Glennon Doyle Melton’s (aka Momastery) “Love Warrior” in twenty-six hours. That is unheard of for me. Because I am a working mom. Because I notice nowadays I can’t really commit my attention beyond a short essay linked from Facebook (and, even then, sometimes that one little click is just too much *scroll on by*). Because I’ve spent the past year trying to come to terms with being bipolar and the reality is, I’ve either been too depressed or too wound up to read for what’s starting to feel like as long as I can remember. I came home from work Friday evening to an empty house and a book-sized cardboard Amazon box. I sat down and I began to read. I didn’t learn to read until I was seven. Nowadays our babies are expected to read in kindergarten. For my oldest, July-born daughter, that meant reading at five. Once I learned to read I rarely stopped. When school got too slow, I hid a novel behind my textbook. When there was any downtime at home, I ran to my room and read. I read Boxcar Children each week with my BFF in the front row at church (until we got talked to about it). It was a great life injustice that I was too motion sickness-prone to read in the car. And, of course, I didn’t read on the soccer field or the basketball court. I read voraciously until I had kids. The final Harry Potter book came out the same month my first daughter was born. I was head deep into everything about her, and I struggled to fall in that deep with the wizarding world. At the same time. While she so incessantly needed me. I couldn’t straddle those two worlds. Reading had always been an escape for me and suddenly I couldn’t afford to go. I wasn’t sure I even wanted to. I picked up maybe a book or two a year. And then I picked up almost exclusively textbooks as I got my associate and bachelor’s degrees, finally graduating with my MSW degree just as my daughter turned seven. I finally had time to read. I read The Girl with The Dragon Tattoo series and The Hunger Games. I picked a couple books out of Entertainment Weekly’s book review section. I’d buy an impulsive book in the airport whenever I traveled for work. And I read self-help. A lot of self-help. Then, I got depressed last Fall. Just as suddenly as when I birthed my first child, I couldn’t read. I couldn’t even watch TV. I couldn’t commit my attention or restrain my concentration. In the year since then I’ve survived primarily on audiobooks. I just can’t sit down and read. I read Love Warrior like I used to read. Tuned out (or tuned in, depending on how you look at it). Engrossed. Unaware of time. Marginally aware of social cues regarding the current appropriateness of whipping out a book and beginning to read. It was exhilarating and it was overwhelming. It was brave of me to go into Glennon’s story like that. This is the story of Glennon’s mess, at least at first. Glennon and I have very similar messes: raging bulimia ended by pregnancy, sobriety inspired by a little one within us, a family formed and thrown together by addiction, loneliness, longing for connection, and the promise that there must be something better. I first “found” Glennon when my daycare provider—and co-parent for the past five years—said her book “Carry On, Warrior” reminded her of me. I put the book on hold at the library and, once I got it, tore through. I saw way too much of myself in Glennon. Except she was a mess and I’d turned my life around and now I was perfect. I had my degrees, a good job, this perfect family, and a beautiful home. I ran myself ragged getting and maintaining the “perfect” body—but at least I’d beat my eating disorder, right? The next year would reveal I’d resumed occasional purging years prior and couldn’t figure out how to tell anyone. The next year I’d discover Brené Brown and the façade of my perfection would start to fall away. I’d write my therapist multiple times about how depressed I was, or how incapable I was of caring for myself or anyone else: I feel like Glennon. Only when I fell apart could I let myself see the true similarities. Love Warrior was a continuation of that for me. Glennon’s candidness about life with bulimia. As a bulimic. Not everyone loses his or her identity in the disorder. But some do. Glennon’s bathroom floor pregnancy test. 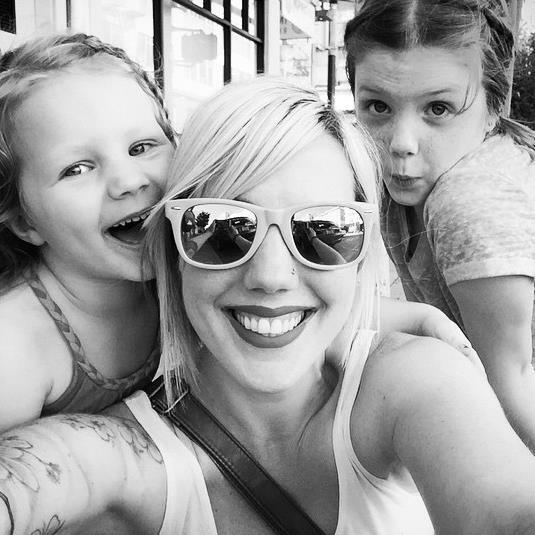 I found out I was pregnant with Ali, my nine-year-old daughter when I was three weeks into outpatient treatment for methamphetamine addiction. I’d opened a bottle of champagne and was actively relapsing (at least according to some–definitely according to the program I was in) when I decided to take a pregnancy test. The sense of serenity that came with that eventual baby. The inevitable growing out of that. Into the chaos. Into the world. Realizing all that pain you packed away has been so patiently waiting. Wondering sometimes who this person is that dared stand beside you. Posting excruciatingly vulnerable things online because it makes you real. And real-ness means you exist. Writing to find yourself. Glennon, I get you girl. I’ve been you and you’ve been me. Your work has touched me in ways I can’t even try to find the words to say. Why go looking for words your insides already know don’t exist? But you get it. I know you do. And I know all the other canaries out there do too. You know who you are. Thank you, Glennon, for this love letter to the world. It was an honor and a joy (and a flood of pain) to receive it. It was worth it. ← When You’ve Leapt: Silence and Secrets and Psych Meds, oh my!